Stupid and brain explosion of highest order remarked a great bowler ! and most of us perhaps would agree with him…… We used to play Cricket daily in the Marina beach ~ in the inner roads nearer sands.. there would be some disagreement, fracas and there were people who would start hitting others … outrage .. stumps, bats etc., also could be used as weapons….. on a different note, was watching a 1st division match (in late 1970s) – the opener after battling for almost an hour against a good fast bowler (neither the batsman nor bowler ever came close to playing for the State) came back to the gallery nearer Buckingham canal on the Marina ground ….. was chatting with his friends .. removed his pads – inside – he had had some wet clothes … and one could see hurting marks in the legs ….partly due to the quality of equipments used in those days. .. In olden days – there would be ball-by-ball commentary (remember Narotham Puri) and then there would be expert commentators (CD Gopinath, Lala Amarnath ….) ~ not confined to India alone … there are experts (and some glamour quotient anchors too) who provide detailed analysis and ideas of what went wrong and how things should have been handled…….. they go in to great detail as to why the result turned out to be so and what they would have done differently….. Some of the people who provide their expert opinion have played little or no cricket in their lives! That perhaps applied not only on the field but off it too…. ask Piers Morgan… if you are to ask who ? ………. Piers Stefan Pughe-Morgan known professionally as Piers Morgan, is a British journalist, television host and former television talent competition judge currently working in the United States. He is editorial director of First News, a national newspaper for children published in the UK and host of Piers Morgan Live on CNN, which he began hosting on 17 January 2011. Morgan has written eight books, including three volumes of memoirs. He did not stop with his writings …… on air the feared quickie Brett Lee challenged Morgan to face his deliveries when the former newspaper editor questioned the courage of the English batsmen facing Mitchell Johnson in the Ashes series. 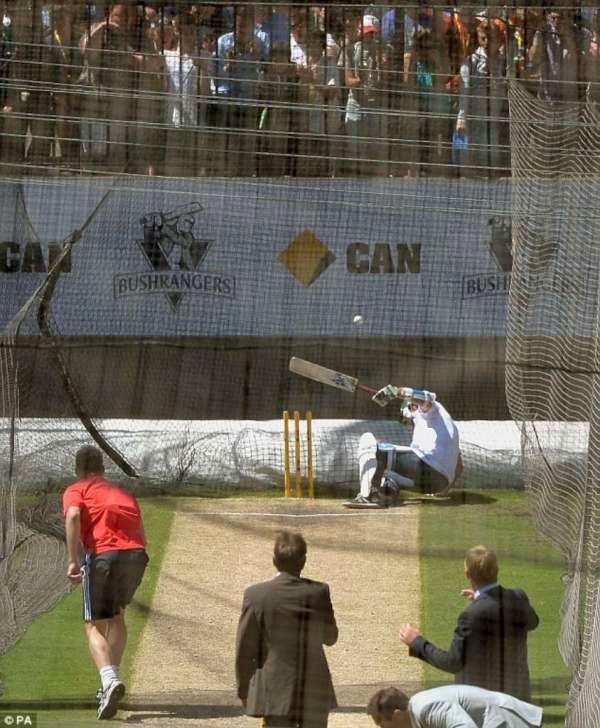 It did not end up there ~ Morgan geared up and entered the nets during the tea break on day two of the fourth Test - Lee proceeded to pelt him with six fast balls, four of which hit Morgan in the body. It was all over in that one over where hell broke free. Morgan faced six balls during tea break and tweeted afterwards: 'Cracked wrist, bruised rib and massive egg on back of head'. As Morgan stood before the stumps in his protective gear, he boasted: 'I'm about to ruin a great Australian legend.' With that, Lee unleashed the first ball, hitting the batsman in the chest. The second ball came, sending the Brit reeling backwards - at which point one of the commentators joked: 'The Australian team doctor is here. Do you need him?' Morgan declined the offer, as the third then fourth ball came at him - and in each case, he failed to hit them. Speaking after the innings, Morgan cheekily described Lee as 'a bit quicker than I thought he'd be for his age'. To his sons, CNN boss and others – he tweeted – I am alive and back …. He tweeted x-ray picture of the cracked rib he suffered after being humiliated by Australian bowler ~ it was reportedly a 90mph delivery. How he keeps tweeting after ending up in a crumpled heap in front of 2,000 jeering Australian fans at the Melbourne Cricket Ground is baffling. The stunt was blasted as 'dangerous and unnecessary' by Sir Richard Hadlee. 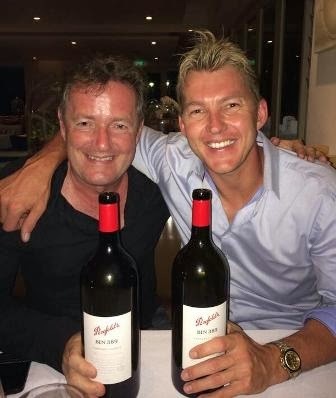 'As a former fast bowler I was appalled and outraged at what I witnessed when former Australian fast bowler Brett Lee faced off British media host Piers Morgan in the nets,' wrote Hadlee, regarded as one of the greatest fast bowlers ever, for Fairfax New Zealand News. 'I only hope that Brett takes a few minutes to reflect on his stupidity - this was a brain explosion of the highest order - it was a deliberate attempt to hit, injure, hurt and maim his opponent that I viewed as a form of grievous bodily harm or a human assault that could have proved fatal. 'I have always admired Lee as a person and as a quality fast bowler but his bowling exhibition damaged his reputation and credibility - in fact I believe he has brought the game of cricket into disrepute.' Morgan responded on Twitter: 'Strongly disagree with Sir Richard Hadlee... I most certainly CAN bat!'. A number of commentators criticised the face-off, suggesting it was irresponsible and dangerous. Follow up news state that Brett Lee footed the bill for dinner and "Well he had to compensate me for every rib he broke," Morgan told Fairfax Media as they left the restaurant just before midnight. Despite his wounds, Morgan insisted he had no regrets and said he hoped his message got through to the English cricket team. He keeps stating that he wanted to prove that a 48 year old was willing to take on Brett Lee and that England players should stand up and not quit. Pace bowlers have threatened rival batsman with their pace and on juicy tracks have hurt batsmen too……. Lillie and Thompson were feared; Len Pascoe hit Sandip Patil on his ear…… WI were most feared in their times and India knows that too well…. In 1976, India toured West Indies under Bishan Singh Bedi. WI won the first test at Bridgetown, by an innings and 97 runs. The second one at Port of Spain was drawn and the third one on Apr 1976 was historic. Indians chased 405 in the fourth innings and won by 6 wickets. In the fourth Test no. 776 in April 1976 - score card would read India 306/6 decl !! ; WI 391 all out. India 97 all out and West Indies making the 13 runs required without losing a wicket. Statistics will never reveal the real story. WW Daniel made his debut in a bloody test, where Indians were intimidated with crowds calling for blood. The short pitched bowling was overdone and Holding from round the wickets caused most damage to the bodies of Indians. Gaekwad’s innings was one of raw courage taking several blows on the body and arms – the gears were not so protective those days. Gaekwad was forced to retire bleeding in his ears ~ that was the test when one player after other had to be escorted to hospital with bleeding injuries. In the Second essay, Gavaskar failed to Holding and half of the team was not fit to play. With 5 batsmen absent hurt – it was recorded that Indians were all out for 97. Those were the days when there were no helmets and the protective gears were not this good ~ Lee – Morgan affair, in any way was far different than that short pitched bowling. Whether point was made, understood and taken is not known …….. Photos courtesy : dailymail.co.uk – news collated from various sources including Daily mail and Sydney Morning hearald.